When we arrived, these big doors were opened for us, and I started to see a valley full of flowers. The flowers were beautiful and their smell was exquisite. We started to walk and experience a total freedom like we had never felt on the Earth. We felt a peace that filled our hearts and while we looked at the flowers we noticed that they were unique; each petal was different, genuine, and had a unique color. Inside my heart, I said to my Lord that I wanted to have a flower like one of these. The Lord gave an expression of agreement, I got close to a flower and started to pull it. But nothing happened, I could not pull the flower out of the ground. I couldn't even pull the petals or leaves off of the flower. Then the Lord broke the silence and said, "Here everything must be done in love." He touched the flower and it surrendered itself to the hand of the Lord. He then gave it to us. We continued walking and the smell from the flowers was still with us. We arrived at a place with a set of very beautiful doors. These doors were not simple, they were very ornate in their craftsmanship and had precious stones engraved on them. The doors opened and we entered into a room with many people. Everybody was running here and there making preparations. Some of them carried rolls of shining white cloth over their shoulders, others were carrying spindles of golden thread, and yet others were taking some kind of plates with something like shields inside them. Everyone was running with effort. We asked the Lord why there was so much effort and hurry. Then Lord bid a young man to come close. This man had a roll of cloth on his shoulders. He came and looked at the Lord, reverently. When the Lord asked him why he was carrying that roll of cloth, he just looked at the Lord and said, "Lord you know what this cloth is for! This cloth is used to make the robes of the redeemed, the robes for the great Bride." Upon hearing this, we felt a great joy and peace. Revelation 19:8 tells us: "And it has been granted to her to be dressed in pure, resplendent linen. For the fine linen is the righteous deeds of the saints." When we came out of that place we felt even more peace, because it was beautiful to see that the Lord Himself was making something nice for us. He has the place and the time for you because you are important to Him. When we came out of that place, our eyes got lost in every detail in Heaven. It's like each thing had life in itself, and every object there was giving glory to God. Then we came to a place where there were millions and millions of children, of all ages. When they saw the Lord, all of them wanted to hug Him, to feel more of His love, because He was their passion. Jesus was the passion of each child there. We felt like crying after seeing how the Lord spoiled each one of these children, how He kissed them and held their hands. We saw how angels got close to the Lord, bringing Him babies wrapped in linen. The Lord caressed, touched, and gave them a kiss on their foreheads and then the angels took them back with them. We asked the Lord why there were so many children there, were those children going to be sent to the Earth. 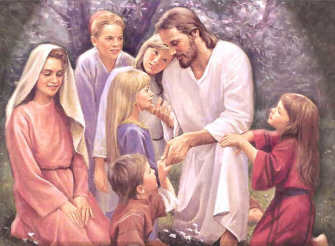 The Lord sounded touched for a moment, and He said, "No, these children will not be sent to the Earth! These are the ones that were aborted on the Earth, whose parents don't want to have them. These are my children and I love them." I nodded my head, and even my voice trembled to ask the Lord such a question. When I didn't know the Lord, the true Life that He is, I made mistakes and sinned like everybody else. Among those sins was an abortion I had. There was a moment where I had to be face to face with the Lord and ask Him, "Lord, is the baby I aborted, long ago, here?". The Lord answered, "Yes." I started walking to one of the sides and I saw a beautiful little boy. Close to his feet stood an angel. The angel was looking at the Lord, and the boy had his back facing us. The Lord told me, "Look, there is your boy." I wanted to see him so I ran over to him, but the angel stopped me with his hand. He showed me that I had to listen to the boy first. I started to hear what the little boy was saying. He was talking and looking in the direction of the other children. He asked the angel, "Are my daddy and my mommy coming here soon?" The angel, looking at me, answered to him, "Yes, your daddy and your mommy are just about to come." I do not know why I was given the privilege of hearing these words, but in my heart I knew that these words were the best gift that the Lord could give to me. This little one was not talking with anger, or pain, maybe knowing that we did not let him be born. He was simply waiting with the love that God had placed in his heart. We continued walking, but I kept the image of that boy in my heart. I know that each day I have to make an effort to be able to be with him one day. I have one more reason to go there, because someone is waiting for me in the Kingdom of Heaven. The Word of God tells us in Isaiah 65:19, "I too will rejoice over Jerusalem and Will delight in My people. No more will there be heard in her the voice of weeping or the voice of crying." We came to a place with some small mountains, and the Lord Jesus came dancing. In front of Him was a crowd of people dressed in white robes and they lifted their hands with green olive branches. When they waved the branches in the air, they released oil. God has great things prepared for you! Now is the time for you to put your heart before Him.